Hi, i've had this WD Black external drive (windows 7) for a while (has data on it), it's was working fine, but since yesterday when i had to disconnect it to move my pc to another room (it didn't get hit or anything) it wont work. I realized the disk didn't show in "Computer", place from which i usually access it, but it shows under "Device Manager". 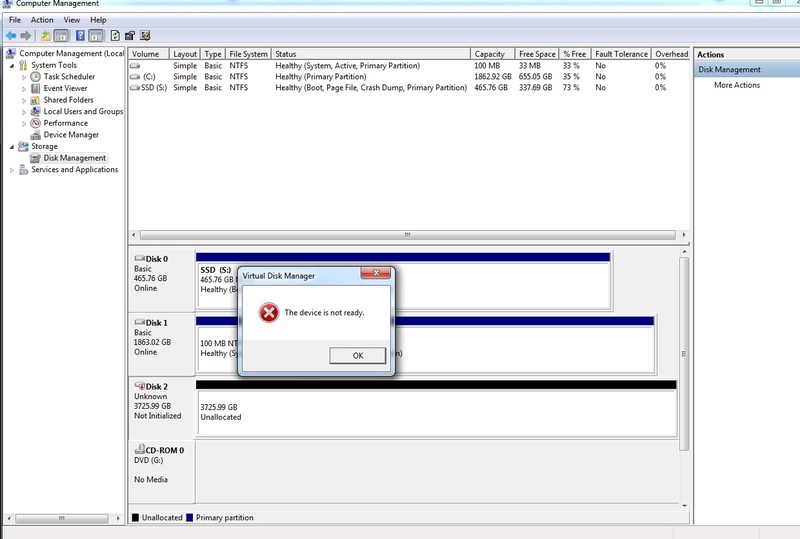 It shows in "Disk Partition Manager" (Disk 2), but when i try to initialize it sends the error: "the device is not ready". The disk shows in DISKPART but, of course, no volume corresponding to it shows there. I tried "updating driver software" from Device Manager and it tells me it's up to date. Tried unplugging it and rebooting. I've seen some similar cases with prompt command instructions but they weren't very clear or some steps were missing instructions. I'd appreciate any help on this issue. Please bear in mind that anything you do may cause loss of data try the External Drive on another computer via a USB connection. See if the external drive works on another computer. Take a closer look at the error message. Have you ever set up a virtual drive? If not then disconnect the external drive and focus on clearing out the "virtual drive" error message. Once that is completed (hopefully) then connect the external drive via the usual USB port and see if the WD external drive becomes visable and accessible again. Thanks for answering. But if i disconnect the external drive, then the "Disk 2" button disappears, so i can even see how i could be able to solve it. Does the Virtual Disk Manager box also disappear? I always wonder about error messages or pop-ups of any sort that do not relate to the system per se. And then try to identify what is causing or creating that error message or pop-up. Try the WD External drive on another computer via a USB port. See if the problem follows the drive or stays with your computer. If the same problem occurs on another computer then the issue is most likely within the drive. Could be hardware or firmware related. Or the drive is corrupted. Try another known working USB cable - just to eliminate a failed/failing cable. Again, as always, be aware that anything you do may lead to further external drive damage or data loss. Check WD's website - download and run their diagnostic software. There are a couple of Western Digital folks who participate in this forum. They may offer other ideas and suggestions. Fine with me. And take a look at your computers's Event Viewer logs. Would expect that there will be some error messages or warnings therein with respect to the "drive not ready" message.